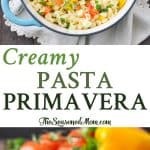 A delicious vegetable packed creamy pasta primavera that's super easy and perfect for busy weeknights! 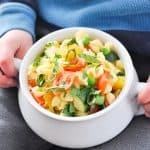 Encourage your family to eat a rainbow of fresh veggies with this quick and easy Creamy Pasta Primavera! 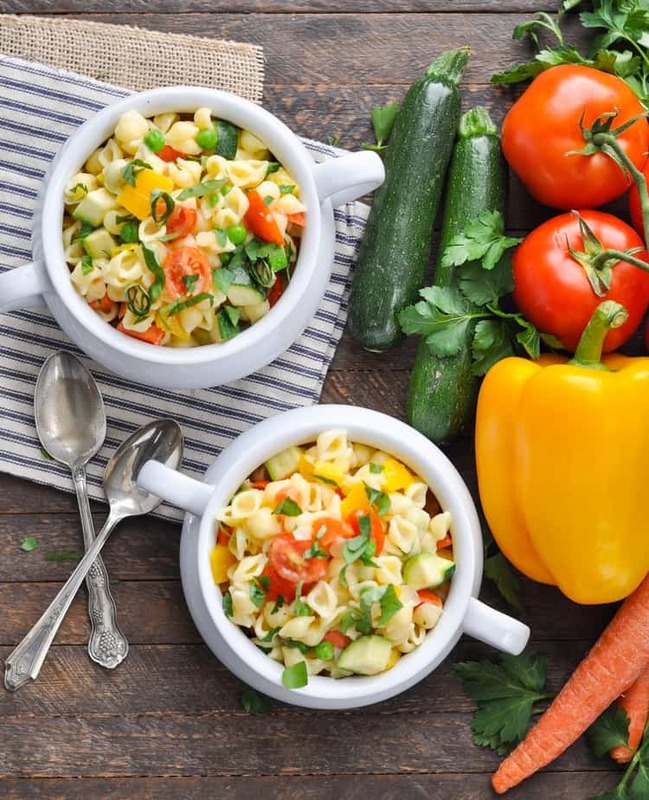 The simple and wholesome weeknight dinner is a convenient way to enjoy seasonal produce in a cheesy, vegetarian dish that’s ready in less than 30 minutes! For all of the Moms out there — do you struggle to “sneak” vegetables into your kids’ bodies? Do you hide the green stuff under piles of Ranch dressing to get your husband to take a bite? The job of nudging, tricking, and hoodwinking our families into consuming a variety of produce can be downright exhausting…and totally unnecessary! Instead of playing games and dancing around the “healthy vegetable” topic, wouldn’t it be nice if you could allow the good stuff to shine through as the star of the show? 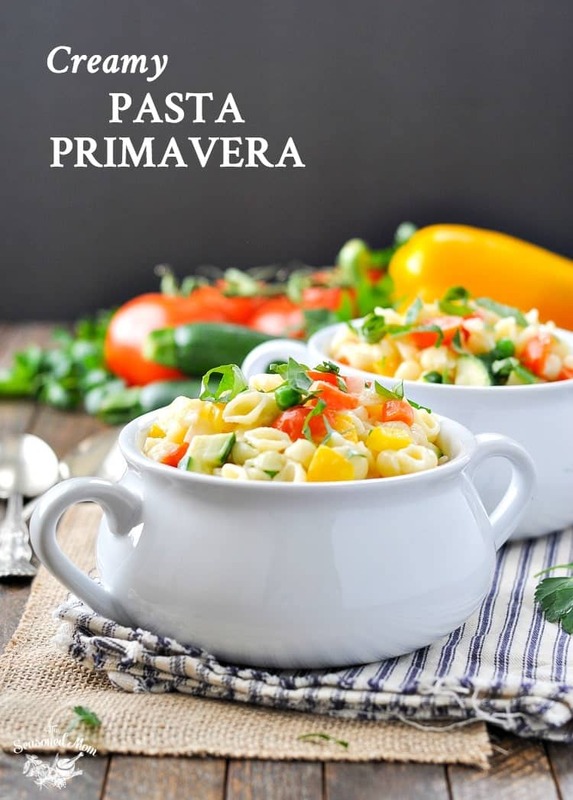 With recipes like this Pasta Primavera, the edible rainbow of colors (straight from Mother Nature) is irresistible — even to the pickiest little palates! Fresh, organic, and nourishing food can be fun and tasty — without much effort on your part! The secret is in the high quality ingredients, the simple preparation, and the beautiful variety of flavors and textures. 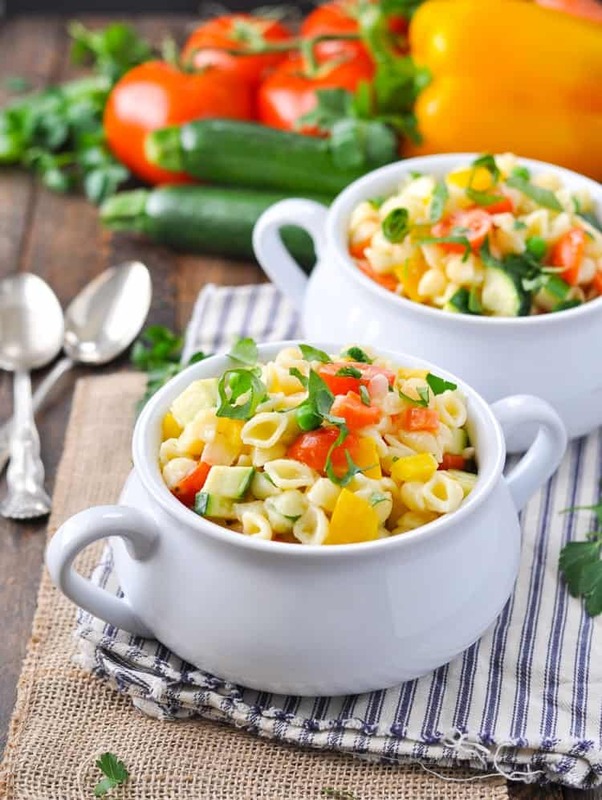 I keep this Creamy Pasta Primavera fast and fresh by pairing a handful of vegetables with one of our favorite pantry staples: Horizon Organic White Cheddar Cheesy Mac. When prepared with Horizon’s organic butter and organic milk, the rich, creamy sauce coats the sweet, crisp veggies for a nourishing dish that’s unbelievably good. I like to get my boys involved in making their dinner, which further encourages them to taste (and enjoy) the meal. 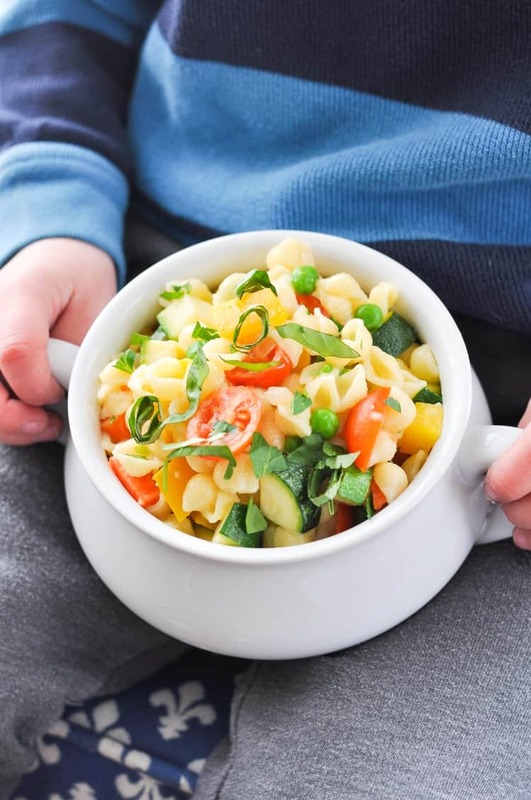 Whether they’re stirring a pot of Cheesy Mac or sprinkling Horizon’s organic shredded cheddar on top of their bowls, they have fun in the kitchen and they get excited about making healthy choices. Sure it gets messy, but it’s well worth a few extra minutes of clean up! When I was taking these photos, my little guy even jumped in and grabbed a bowl for himself. It was almost lunchtime, and he couldn’t wait any longer! And when Casey (my 5-year-old) saw the spread of fresh ingredients on the counter, he just stared and them and said, “Wow. That looks good!” I didn’t even have to add the vegetables to the macaroni and cheese to convince him that they would be tasty — he was just drawn to the beautiful colors! 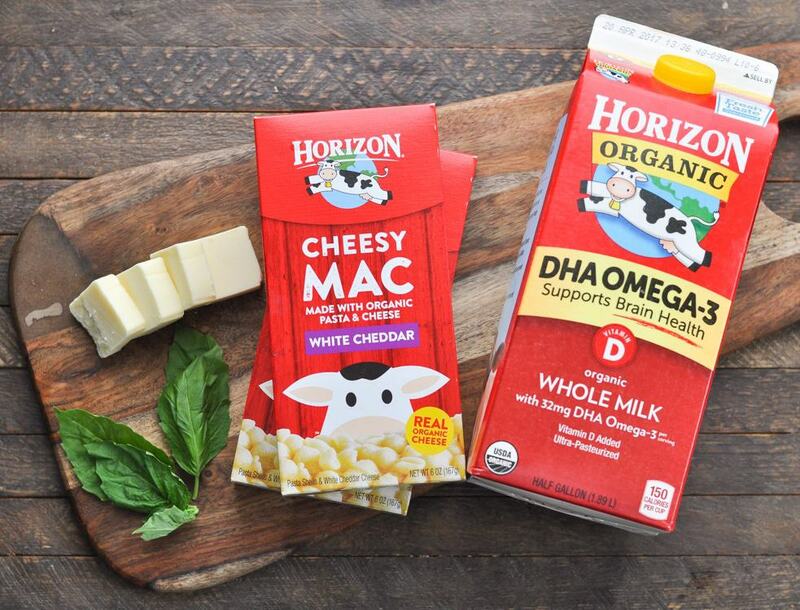 With simple, high-quality ingredients like Horizon’s organic dairy products and Horizon’s organic macaroni and cheese, pulling together a fast and fresh vegetarian dinner — that your family will actually love — has never been easier! I hope that you’ll enjoy this season’s rainbow of flavors in a big, satisfying bowl of Creamy Pasta Primavera! Do you want to see just how EASY this recipe is? Check out the video below! Cooking for a smaller family? You can easily cut all of the ingredients in half (using just one box of Cheesy Mac), and prepare according to the instructions above. Want to Prep Ahead? For even speedier last-minute prep, I like to chop all of the vegetables in advance and keep them in airtight containers in the refrigerator. When it’s time to make dinner, the prep work is already done! Prepare both boxes of Cheesy Mac according to package instructions. Meanwhile, melt additional 2 tablespoons of butter in a large skillet over medium-high heat. Add carrots to the skillet and sauté for about 2 minutes. Add zucchini, bell pepper, tomatoes, onion, and garlic. Cook, stirring, about 1-2 more minutes, or until tender. Add the prepared mac and cheese to the skillet with the vegetables and toss to combine. Add the frozen peas to the hot skillet and stir until warmed through (about 1 minute). Garnish with fresh basil and shredded cheese, if desired. Want to Prep Ahead? For even speedier last-minute prep, I like to chop all of the vegetables in advance and keep them in airtight containers in the refrigerator. When it's time to make dinner, the prep work is already done! If you’re looking for even more fresh and simple ways to feed your family, be sure to follow Horizon Organic on Facebook, on Pinterest, on Instagram, and on Twitter. You can also sign up for the Horizon newsletter here! Previous Post: « 30-Day Challenge: A Month of 5 Ingredient Dinners! What a great way to sneak more veggies into our diet! 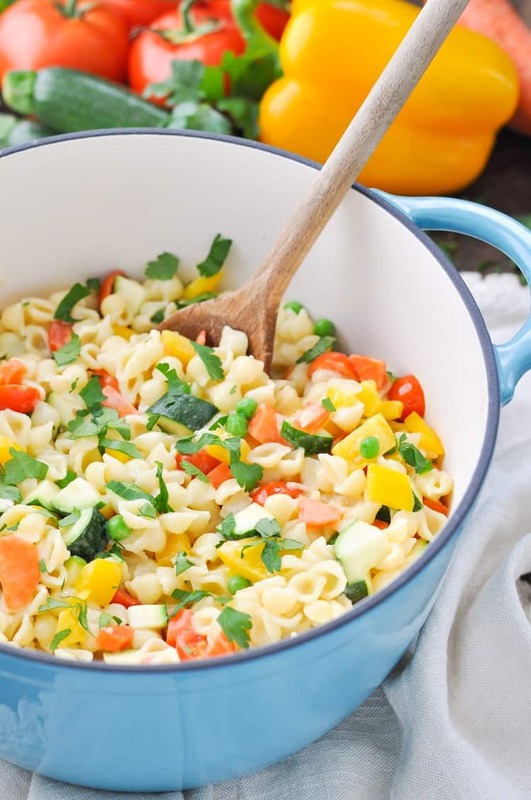 Eating the rainbow veggie wise is such a great idea, especially when it’s in pasta form. I know my husband would love this, so I’ve got to try this. Sounds so flavorful and easy to make! 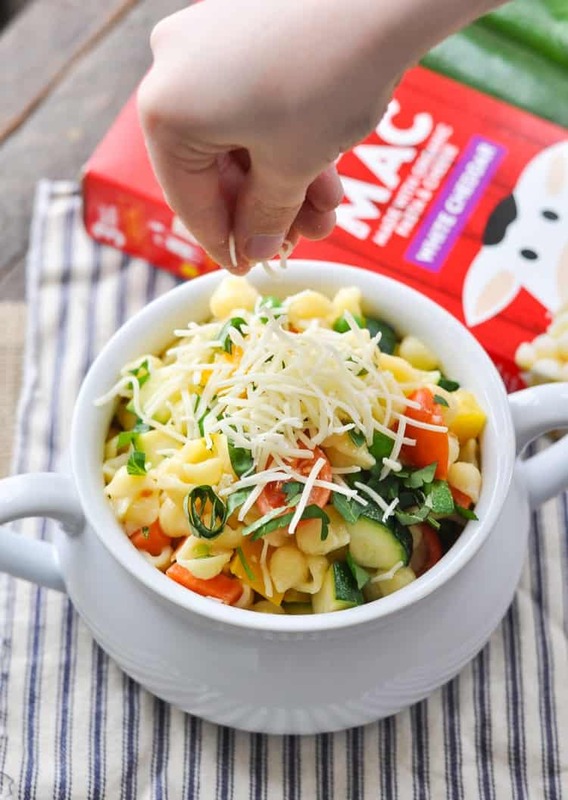 Yep — it’s perfect for the guys who might not otherwise want to eat all of the veggies…but they’re totally on board with the mac and cheese! Are other brands of white cheddar Mac and cheese available? Horizon brand is not available in my area. This is my favoruite type of pasta, healthy and packed with veggies!